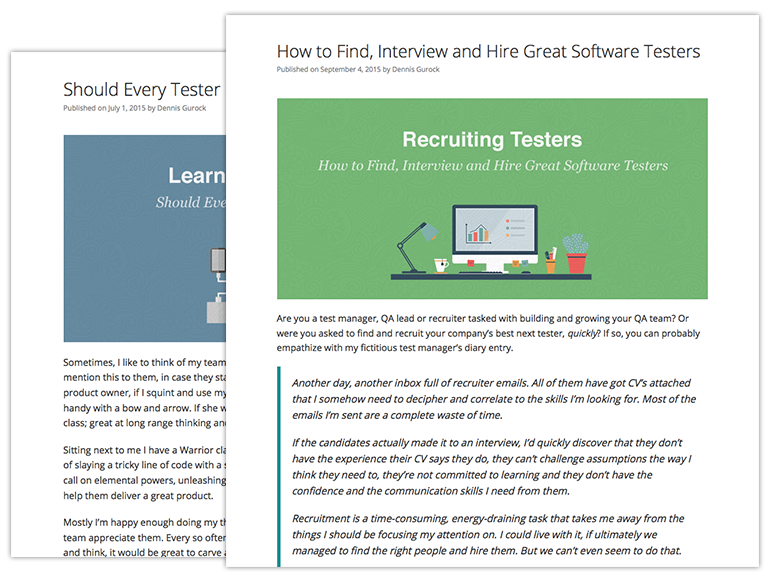 In our recent article I wrote about an approach to finding, interviewing and hiring the best testers. In it, I suggested that when carrying out an interview you should stick to a script so that, if you need to compare results across a number of interviews, you can at least be assured that the same questions were asked each time. To help you out even further, we thought we’d go the extra mile and provide you with a list of questions too! And to make sure we had the very best questions, we even approached some of the best thinkers in the testing community and included their responses below. When you start your interview, you want to give your candidate every possible opportunity to shine and show you their best qualities. Use the questions below to help break the ice and get them warmed up ready for some tougher follow-up questions. What is testing to you? Do you have a testing paradigm? Can you explain it? Why did you choose software testing as a career, and what motivates you to stick with it? Tell me about the work you’ve been doing recently. What’s the most interesting bug that you’ve found, and why? What kind of challenges does testing present? Can you tell me about some specific software testing challenges you’ve faced, and how you overcame them? Hiring an awesome tester isn’t just about making sure they have the right skills for the work you need them to do. It’s of paramount importance that they are a fit for your organisation and the team they’ll be working with. Use the questions below to help you figure out where their strengths and weaknesses lie, and whether their values align with yours. Have you encountered any challenges working with your colleagues? Tell me about a specific instance when you were in a difficult situation, and how you dealt with it. How about situations where you have to make decisions… Have you ever made a bad decision? What contributed to you making that decision? How did you deal with the consequences? How have you added value to the organisations you’ve worked with? Can you give me a specific example from your last or current position? What process are you using for testing currently? Can you describe how you might improve it? Now we’re getting to the good stuff. What kind of a tester are you dealing with here? Do they know their edges from their corner cases? Can they distinguish between a test and a check? Do they understand their biases and models, and how a worldview can influence their approach and decision making process? Use the questions below to dig deep into their testing toolkit and to make sure they don’t view every testing problem as a nail to be pounded with a blunt instrument. What kind of tests have you been doing? What do you enjoy about them? How do you develop those tests? When you perform a test, what steps do you take? What’s your process? Have you ever written a test plan? What would you put in one? How do you prioritise your testing? What factors might influence your decisions? How do you know when it’s time to stop testing? What’s the role of risk in your testing? How do you analyse and measure it? Do you measure how effective (or not) your testing is? What metrics do you use? If I left you testing for two hours, what would you have to show me when I returned? No doubt many readers will be hiring for automation skills; but being able to automate testing activities isn’t just about understanding the right tool, language or framework. It’s about identifying where the risks to the product are and then being able to pinpoint those risks by developing intelligent, reliable and repeatable automated tests. You want your tester to help you speed up the development and delivery of your product, not slow it down. Use the questions below to help you figure out whether they have the depth of knowledge to do so. Have you automated any of your tests? How so? What’s your favourite testing tool? Why? If some technical constraint meant you were unable to use it, what would you do instead? How do you know when you (or your automation) has found a bug? What makes it a bug? Are some bugs more important than others? How do you report them? What do you do if the developers decide the bug is not a bug? How do you decide which tests to automate? Which tests don’t you automate, and why? Finally, if you’ve made it to the self-development questions and are still interested in the answers, you may have found a keeper! But are they in it for the long term? Is software testing a passion, or just filler until they can find a proper job? How do they learn, and what keeps them motivated to do so? Use the questions below to probe your testers long-term commitment to the role. Testing can be challenging. What keeps you motivated? How do you stay at the top of your game? What self-learning do you do? What have you been criticized for in the past? How did you respond to that criticism? What did you do about it? Describe the characteristics of your ideal boss, and why. Of course, you may have your own set of interview questions. If you do, how well do they correspond to the questions here? Do you have some that you think should have been on the list but aren’t? Please tell us about them in the comments section below. Also, we’d love to hear from you if you disagree with any of the questions above. Why do you disagree? What would you use in place? Let us know!